Bleeding is one of the most serious and most frequent complications encountered in patients who suffer from cirrhosis of the liver. Therefore, the maintenance of good capillary resistance is of life-saving importance. The efficacy of OPCs in improving capillary resistance in patients suffering from cirrhosis of the liver was tested (double-blindly) in 1983. The researchers reported that with a dosage of 300 mg of OPC per day, they induced a significant improvement of capillary fragility. OPCs, Dr. Jack Masquelier’s Mark on Health briskly tells you how and why Dr. Jack Masquelier’s discoveries and inventions are of essential importance to human health. 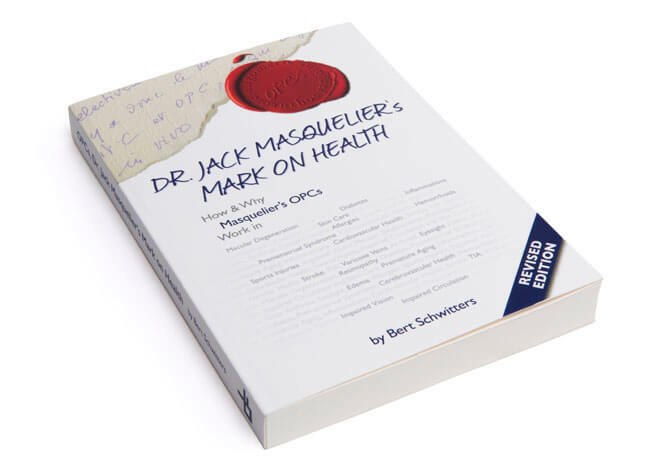 In OPCs, Dr. Jack Masquelier’s Mark on Health investigative researcher Bert Schwitters explores and explains the limitless revelance of the products of Dr. Masquelier’s scientific work in today’s life.